Hundreds of thousands of soldiers and civilians died in the first months of World War I, which changed the way war was waged. The war was supposed to be over by Christmas of 1914, but by December the war was stuck in the gruesome trench warfare WWI is known for. On Christmas Eve and Day a spontaneous truce broke out on the Western Front against the orders of high command. But for one night and one day, some units in the warring parties – the armies of France and Britain on one side, and Germany on the other – put down their weapons for the briefest of moments to celebrate a holiday that brought opposing sides together. 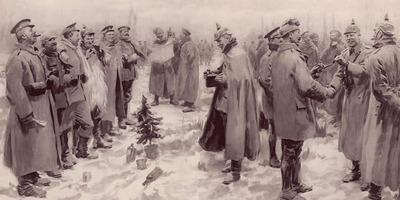 Huddled in their trenches on Christmas Eve, soldiers on both sides across the entire Western frontline celebrated the holiday as best as they could. Soon, all along the frontline combatants began to leave their trenches without their weapons, and meet enemy soldiers in no man’s land. 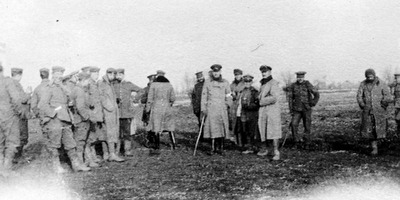 Wikimedia CommonsBritish and German troops meeting in No-Man’s Land during the unofficial truce, 1914. “During Christmas Day our fellows and the Saxons fixed up a table between the two trenches and they spent a happy time together, and exchanged souvenirs and presented one another with little keepsakes,” one British soldier wrote. In some places, soccer games were held in no man’s land; sometimes against each other, and sometimes with mixed teams. “The regiment actually had a football match with the Germans who beat them 3-2,” an officer in the Royal Army Medical Corps wrote in a letter to a friend in London. “It speaks to the common humanity in the midst of war, and to the very best of who we are – which is one of those things that we recognise during the holiday season,” Lora Vogt, the Curator of Education at the National WWI Museum and Memorial, told Business Insider. Sadly, the high commands of both sides did not approve of the actions of their soldiers. Some units were punished or transferred to other parts of the frontline, and no truces were ever held again for the rest of the war.